Bernie Gunther returns in the twelfth book in The Sunday Times and New York Times bestselling series, perfect for fans of John le Carre and Robert Harris. Lee Child calls Bernie Gunther 'one of the greatest anti-heroes ever written'. It's 1956 and Bernie Gunther is on the run. Ordered by Erich Mielke, deputy head of the East German Stasi, to murder Bernie's former lover by thallium poisoning, he finds his conscience is stronger than his desire not to be murdered in turn. Now he must stay one step ahead of Mielke's retribution. The man Mielke has sent to hunt him is an ex-Kripo colleague, and as Bernie pushes towards Germany he recalls their last case together. In 1939, Bernie was summoned by Reinhard Heydrich to the Berghof: Hitler's mountain home in Obersalzberg. A low-level German bureaucrat had been murdered, and the Reichstag deputy Martin Bormann, in charge of overseeing renovations to the Berghof, wants the case solved quickly. If the Fuhrer were ever to find out that his own house had been the scene of a recent murder - the consequences wouldn't bear thinking about. And so begins perhaps the strangest of Bernie Gunther's adventures, for although several countries and seventeen years separate the murder at the Berghof from his current predicament, Bernie will find there is some unfinished business awaiting him in Germany. 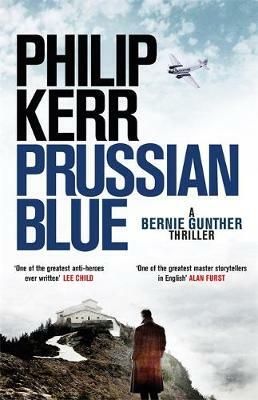 Since the late eighties, Philip Kerr has been redefining crime fiction with his justly-lauded Bernie Gunther sequence. The original trilogy – March Violets, The Pale Criminal and A German Requiem, available also as a stand-alone collection Berlin Noir – is considered one of the great highpoints of crime literature. After a break of some fifteen years, Kerr resurrected Gunther for a storming sequence of novels, set before, during and after WWII, fully fleshing out this dark, conspiratorial universe into one of fiction’s great story arcs.